Camden Caley is a quiet, pet-friendly community offering one, two, and three bedroom apartment homes. This tucked-away apartment community in Centennial is still only minutes away from I-25 and I-225, Sky Ridge Medical Center, and zoned in the premier Cherry Creek School District. Cherry Creek State Park is right next door, complete with the Cherry Creek Reservoir, hiking trails, camping, and gorgeous mountain views. Also, watch the 2016 Super Bowl Champions, the Denver Broncos, practice just a few miles away at their world-class Training Center! Camden Caley apartments match the great surrounding area with equally impressive amenities you have been looking for. Stylish interiors include features like granite countertops, washer and dryer, walk-in closets and patios. During the colder months, we have garages available to keep you and your car warm, as well as cozy fireplaces inside your home. Our community is also the perfect place to unwind or entertain. Soak in the hot tub, take a dip in the resort-style swimming pool with outdoor grilling stations, work out in the 24-hour state of the art Fitness Center, or play with your furry friend at our Dog Park! We also have a business center with a computer and wifi printer/fax/scanner. Residents receive a technology package with a savings of up to 48% off retail. This money-saving package includes high-speed internet up to 150 Mbps and over 140 digital video channels through Xfinity. Use the Xfinity Go app on your smartphone or tablet to access your digital video anywhere! Live the relaxed life at Camden Caley – stop in today and check us out. All pets must be pre-approved by management. Some of our apartment homes offer a direct access garage and we offer detached garages for $95.00 per month. 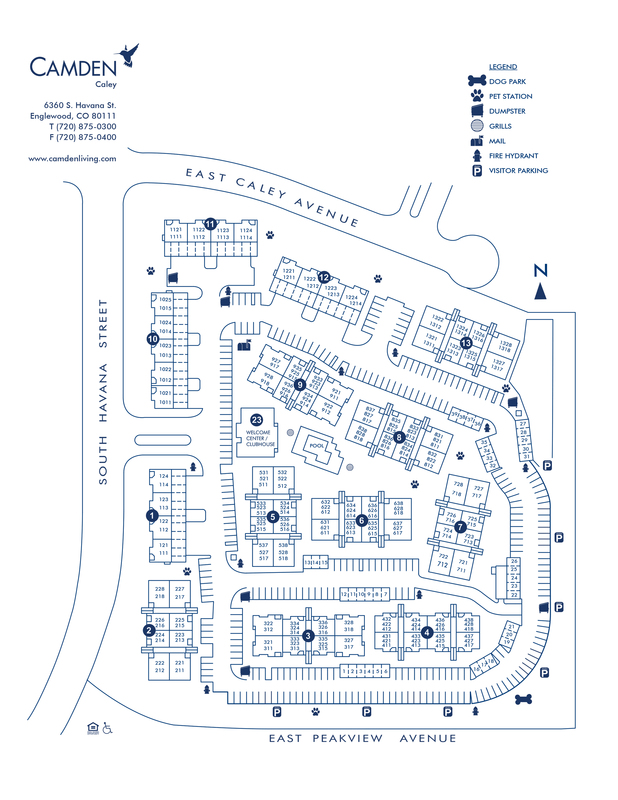 Visitor parking is located around the perimeter of the community.